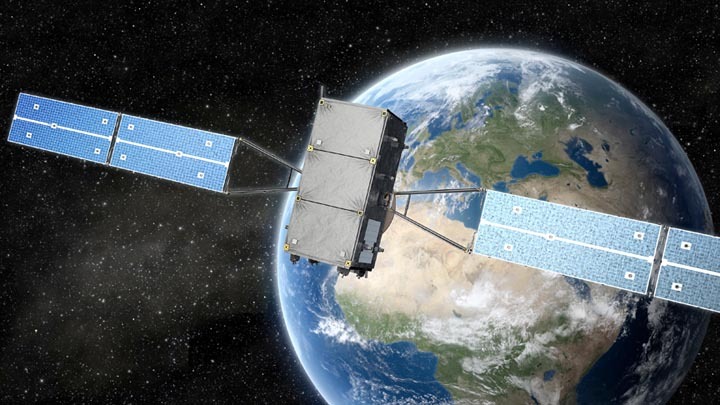 [Updated October 11, 2012] The next two Galileo satellites have been cleared for launch on Friday (October 12, 2012), a couple days later than originally planned. Follow the Galileo IOV launch live online here. coverage resumes at 21:25 GMT (23:25 CEST). The pair of in-orbit validation (IOV) spacecraft have been enclosed within their protective fairing and moved to join the Soyuz rocket on the launch pad at the European spaceport in Kourou, French Guiana. A successful launch would put four Galileo IOV spacecraft in orbit, the minimum number needed to provide enough signals to achieve a position fix on the ground. The two satellites are also the first to carry search and rescue antennas to help locate aircraft and ships in distress as part of the international COSPAS–SARSAT system. On Wednesday (October 10, 2012) the twin Galileo satellites atop their Soyuz rocket took part in a full-scale dress rehearsal for launch. Its completion keeps the satellites on schedule for their planned Friday evening liftoff. “The satellites are now switched on,” says Nigel Watts, in charge of ESA’s Galileo In-Orbit Validation satellite procurement. "If all goes to plan, the satellites will remain turned on for their flight into orbit and for their entire mission lives, until they are sent into a graveyard orbit at the end of their lives, some 12 years from now." Wednesday’s dress rehearsal was based around a simulated launch taking place at exactly the same time of day, involving the same teams and communication links to be used during the launch. The 4.1 meter–diameter fairing protects the satellites from the stresses of launch and flight through the bulk of the atmosphere. It will be ejected about three and a half minutes into the flight, when the upper stage reaches the top of the atmosphere. The Fregat-MT upper stage, modified to carry extra propellants, will fire for the first time about 10.5 minutes after launch, raising the satellites up to orbital velocity and their operating altitude of 23,222 kilometers (~14429 miles).